Security is massive issue for ecommerce websites. Hackers are forever coming up with new ways to hack into presumably secure areas, with this in mind we need to do everything we can to minimize the risk of this happening to our websites. Magento is one of the best ecommerce platforms on the market, but with such a large amount of users it can also be a target for hackers. A simple security update you can make to your Magento ecommerce website is to change the default URL for the Magento Admin Panel. This is a quick way to give a little extra security to your ecommerce website. NOTE: Before we start, please DO NOT use the web interface that is built in to the Magento Admin Panel to change the admin path, this can cause numerous errors! Now, all you have to do is swap the word admin for whatever name you like for your new Magento admin path. Choose something personal which would be impossible to guess. You can use letters and numbers but no special characters. Save the file and if necessary upload it back to the app/etc folder. Lastly we just need to delete the cache so that the changes will show online. Use your favorite FTP client (we like Filezilla), return to the Magento root directory and then delete everything from the var/cache/ directory. DO NOT delete the var/cache folder itself, just contents of it! And that’s it – simple security in minutes. We hope this helps improve the security on your website, if you have any other handy Magento security tips please feel free to post them below, we’d love to hear from you. It happens to us all at one point or another, be it bad service from our web hosting company or just a better deal elsewhere, sometimes you just have to move your ecommerce website to a different hosting company. This can be quite the daunting task with your whole online business at risk if something happens to go wrong. Many ecommerce website design companies will do this for you, but if you are going to attempt this yourself please read our easy guide detailing how we here at Unltd Ecommerce move our sites. Before we start I would just like to state, we are not saying this is the only way to move your website, or even the best. This is just the tried and tested method that we used when moving all of our clients websites from our old hosts to the awesome new company. First things first, download your entire website to your computer using your favorite FTP client. Now we are going to back-up our database. First we will login to our Magento admin panel, visit the “Cache Management” button and Refresh all of the Caches for your website. 2) Use a MySQL tool like myPhpAdmin or HeidiSQL to Export your entire database as a .sql file. Now we need to install copy of Magento on your new web server and go through the Magento set-up process as usual. Most web hosting companies these days give you a temporary address for your website which you can use whilst waiting for your domain name to circulate. This is perfect for this process as it allows us to leave our existing website live online whilst we completely set-up the new version of it on and new server. Now with your empty version of Magento installed and working on the new server you can upload the backed up version of your ecommerce website that you created at the start of this tutorial. To do this simply connect using your favorite FTP client, highlight all of the backedup files and folders and press “Upload” (If asked be sure to select “Overwrite”). Now we have all of the files in the correct place we just need to move your database over too. 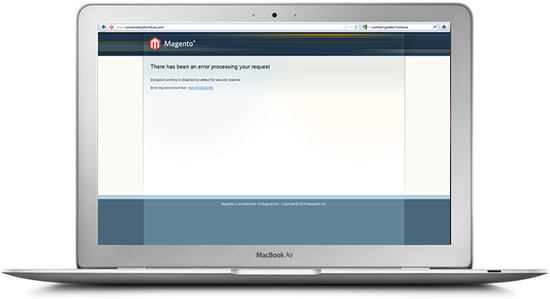 Login to the database of your new web server and delete all of the tables Magento has created. Once they are all gone you can select “Import” and select your .sql or zip file created above. Press import, cross your fingers and as soon as the import is completed your can check your new website online. It really is that easy, all that is left to do is change the DNS server addresses for your domain name to point to the new server. Once this is done you can go to your Magento admin on your new server and change the websites URL in the Configuration > Web section. Simples. I hope this helps you move your ecommerce website with ease. If you want to hire a professional ecommerce website designer to complete this for you be sure to get in touch. There has been an error…. When we first saw this message (after the initial panic), we jumped straight to Google to try and find a quick fix and the reason for this error occurring. Unfortunately, after searching for Exception printing is disabled, there was very little help to be found online for this. Luckily, one of our guys here in the office had seen this before and managed to work out the solution in just a few minutes. Now just go to the main Magento folder and create a folder named “tmp” – Simples! I hope this is of some help to you all so you don’t have to spend too long trying to fix this error. 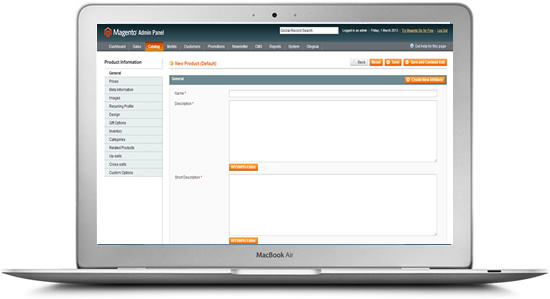 This article is all about the Magento Simple Product. Here at Unltd Ecommerce we feel that Magento is the best ecommerce platform on the market, we use it for a great deal of our ecommerce website design packages. Magento gives you an amazing content management system that allows you to manage your website yourself from any browser using your secure username and password. To help you do this Unltd Ecommerce have put together a collection of articles and “how to’s” to guide you through the management of your ecommerce website, starting this one for the addition of a Magento simple product. To set-up a Magento simple product , firstly you will need to go to Catalog > Manage Products and then click the “+ Add new product” button. The next page will give you options but simply select the standad “Default” and “Simple Products” options. Type the full name of the product into this field. In simple products, you cannot customise the product so if you have similar products, they will all have to have unique product names. 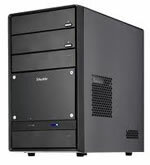 Enter a detailed description here that will appear as the full description on the product page. This can be as long and detailed as you wish and can also contain images and links if need be. Here, just enter a brief description that will appear in list view on the catalogue page and above the price on the product page. All products require a unique SKU which can be anything you like, but must contain numbers and letters with no spacing. You do not have to fill in this part, it is totally up to you. If you have a store that sells a number of products then this is a good way to separate them but it’s down to you. This drop-down box needs to be set as ‘enabled’ to ensure the product is visible in the catalogue. You can select ‘disabled’ status before you introduce a new product or if the product is discontinued. If a product runs out of stock, it will appear as ‘Out of Stock’ until you replenish the stock. The URL is used as a link to this product, therefore it has to have a unqiue value. This can be more than just the product name. In fact, for SEO reasons, it will be a great advantage if your URL key contains additional key words. For example, if your product is called – Glass Table, your URL could read ‘handmade-glass-table’. The Visibility setting determines whether a visitor can find this product by browsing the catalog, by searching for the product, or both. Some people like to click “Save And Continue Edit” at this point! By doing this you will see that the product is not visible in the catalogue, this won’t happen until it has been assigned to at least one website and category. So let’s move on to the next tab…. Click the prices tab from the left and you will see a new page of options. Enter your selling price for the product in the first box. You may also want to offer the enter your Manufacturer’s Suggested Retail Price (RRP) to show the saving the customer would make by buying the products from you. Assign the correct Tax Class. If you are a UK company you should have the standard VAT setting. Click the Meta information tab from the left menu. Here you can upload the image files for each product. You can specify a separate image for the thumbnail, small image and the main image or just use the same one for each. The file sizes for these will depend on the design of your site, so be sure to ask your website designer for advice here. This section all really depends on how you have your inventory management set-up in your System > Configuration > (Catalog) Inventory tab. If you have set the Decrease Stock When Order to Yes then the system will keep track of inventory by automatically maintaining the Quantity in Stock for each product. In the Qty field for the product, enter the exact current quantity in stock, or a high value if you don’t keep track of inventory (System > Configuration > (Catalog) Inventory > Decrease Stock When Order is Placed is set to No). Use the Minimum Qty for Item’s Status to be Out of Stock setting to define when the product enters an Out of Stock status and no longer can be ordered. If you sell the same products both online and in a regular store, you may want to set a certain threshold where online orders are no longer accepted even though you still have a minimal quantity in stock. The Minimum and Maximum Qty Allowed in Shopping Cart setting prevents customers from ordering less than a designated minimum quantity, or more than a maximum quantity. The Qty Uses Decimals setting determines whether decimals will be used in the quantity field for the product (e.g. “3.5 yards”) or not. The Stock Availability setting quite simple shows you if the product is in stock or not! Be sure the Qty is set to more than 0 and this box is set to In Stock . Select in what websites you want this product to be visible. Note that you must assign the product to one or more categories in each website before it appears in the catalog for that website. Just tick the boxes for the categories you wish the products to appear in. If you have categories within categories be sure to click the + sign next to the main category to show you the nested list. And that’s it – SIMPLE! Click “Save” and the product will now be visible live on the website.